What more could you ask for from your flapper jewellery? 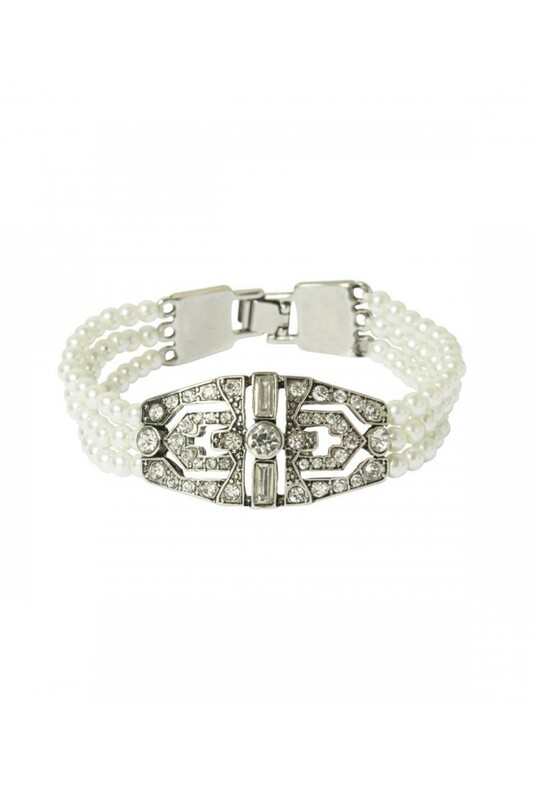 This Deco Pearl Bracelet really is one of kind with that incredible art deco cut out design set against those classic 1920s pearls. This triple row pearl bracelet makes a wonderful gift as it really is a special piece of vintage jewellery that will never go out of style. Team with pearl drop earrings and a silver beaded dress for a party outfit that will wow. - Triple row of faux ivory pearls (never too many pearls). - Silver tone metal centre piece in symmetric, linear design with diamante decoration (Buchanan bliss).